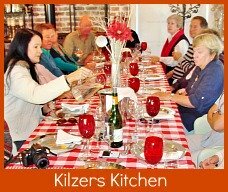 The flavours of France, Sedgefield’s September Slow Food Workshop was held at Blackwaters River Lodge set back from the N2, on the opposite side of the road to Buffalo Bay in a serene green setting along the Goukamma River. 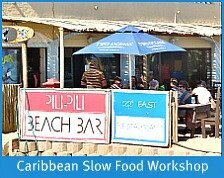 The workshop began in a very relaxed manner with the Slow Food participants getting re-acquainted over drinks in the spacious bar lounge. 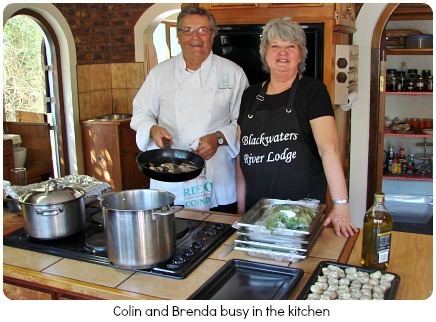 I went to find Chef Colin hard at work in the kitchen and Brenda, our hostess for the Flavours of France luinch, busily ensuring things were in order. 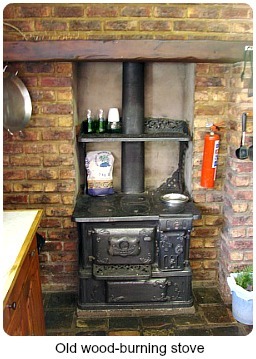 I discovered to my delight, an authentic and beautiful old wood stove in the kitchen. I’d love to have one in my open-plan kitchen today. It would truly be a multi-purpose appliance. I could cook on it using up alien wood and warm the dining room, lounge and kitchen all at the same time. It took me back to the smell and the taste of my grandmother’s bread when it came out the oven of her big wood stove on her farm at Platrand outside Standerton in “die ou Transvaal”! Going to the farm for holidays was a big adventure for my brother and I. There was no electricity there in the 60’s. Light at night came from oil lamps. Water for the bath was heated in a big basin on the top of the stove. The toilet was a “long drop” about 400 meters from the house and if you needed the loo in the night you had to use a chamber pot that was tucked away under the bed! 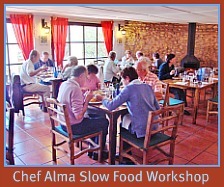 Before long, Colin called us to the dining room to begin the Flavours of France workshop. Gerhard Beyleveld of Leeuwenbosch Dairy began the workshop by telling us how he started off on his Rheenendal farm in 1970 milking only one cow a day. Today (2012) they milk 1400 cows a day processing 19000 litres of milk. They buy in milk from other dairy farmers in the area managing 30 000 litres a day and supplying milk to Shoprite Checkers and Spar from Riversdale to Port Elizabeth. 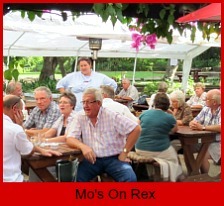 Nowadays Gert, Gerhard's one son runs the agricultural side of things and the other son, Hein runs the factory. 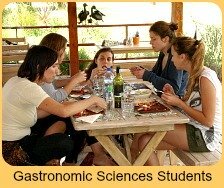 They make Gouda, Cheddar, Feta and Mozzarella cheeses, cream, butter and yoghurt. 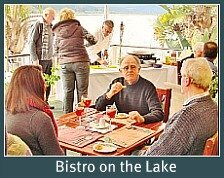 Eighteen months ago, Gerhard says the sons pensioned him off to oversee the farm stall where they sell all the products within the tearoom they have opened to the public. 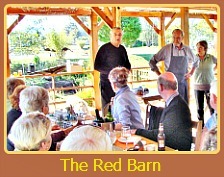 He thoroughly enjoys this aspect of his farm with Jane his assistant, managing the restaurant. 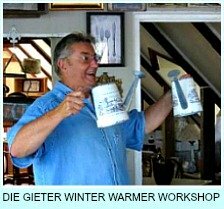 Gerhard presented the workshop with a magnificent cheese platter that was raffled simply by our names being written on pieces of paper, being put into a box and the lucky name drawn was a delighted Roy Phillips. 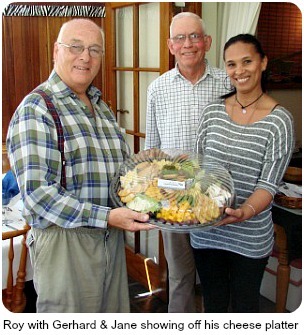 Then it was Vinessa Van Rensburg's turn. 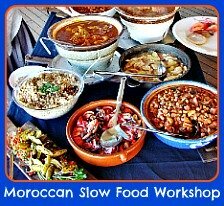 She explained how much she's always loved cooking and to change her focus from just her day job (it might be a mid-life crisis) she decided to start selling her relishes in earnest because they did so well on hamburgers at this year’s Slow Festival. Currently she makes a tomato relish that goes well with pastas or on hamburgers or in casseroles. It can also be added to mayonnaise. 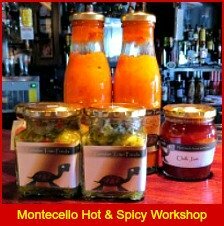 She makes a very popular chilli, one using jalapeno chillies mixed with garlic and fresh herbs. Neither of the relishes has any preservative in them. 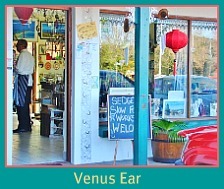 She supplies them in large buckets to some local restaurants and they’re also sold at outlets like German Lane and Venus Ear. She has in the pipeline a few other relishes she's busy perfecting. 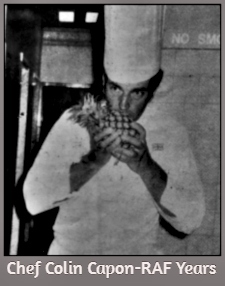 Chef Colin began his salad dressing with a quip about once having to decorate a naked lady (Sofie Dix) with food for some French film starring Colin Firth with I suppose, the naked lady, and that he had to go home and practise on Auriel (his wife)! Clearly being a chef presented him with many unusual experiences! Back to the salad dressing! He told us that the demand for olive oil today is so great that in most instances, one buys blended oils. That is not bad but one shouldn’t buy a label that only says “vegetable oil” because that could have some questionable components in it, like leaves and bark that are all mushed up together. These irregular additives could contain toxins and/or pesticides. Besides that, it is worth remembering that no oil benefits from high heat and reheated oil isn’t very healthy either. 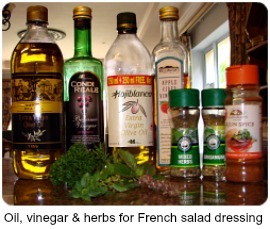 To experience the flavours of France, in a recently emptied but unwashed jam jar (to give a bit of sweetness), he makes the French dressing with one-part vinegar to 3-4 parts oil. Lemon juice can be used instead of vinegar. Then he adds dried or fresh herbs, salt and pepper and some Dijon or grained mustard. This concoction shaken up and left to stand until needed for the salad. This will keep for a fairly long time in a cool place and even better in the fridge. 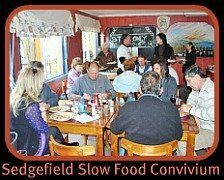 It was time for the starter of the Flavours of Franch luncheon - escargot with garlic and melted butter and crunchy French bread - what a treat! 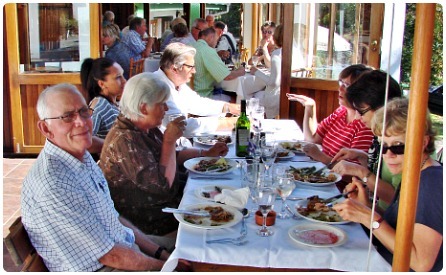 The main course included two meats – Coq au Vin – chicken, casseroled in red wine and served with sautéed mushrooms. 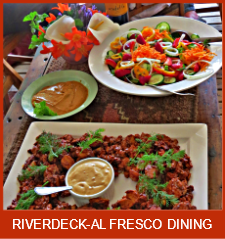 This was Blackwater River Lodge's signature dish made by Brenda and it was very tasty. Colin made the second meat dish, Duck a l’Orange which he said involved a very complicated procedure which people would hardly trouble to make in their homes, so we were lucky to have a chef make it for us! 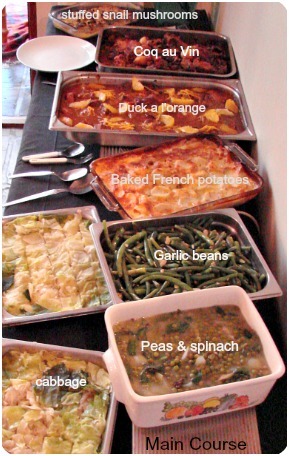 Vegetables included garlic stringed beans, French baked potatoes, baked cabbage, and spinach with peas and beans. There was a French salad made with beetroot, tomatoes, rocket, baby spinach, apples and pears and crumbled blue cheese plied with Colin’s freshly made salad dressing. 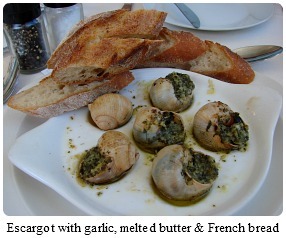 Lastly, delicious cream-baked whole mushrooms each stuffed with a snail. What a feast! Finally for dessert, Colin had made a very rich and sweet Prune Tart with a marzipan base. It was served with lashings of whipped cream. There were also two divine Strawberry Tarts - one of the nicest I've ever tasted. I could have really pigged out and eaten a whole one by myself if it had been the only item on the day’s menu. I fully understand why my brother, Steve calls dessert, Main Course. 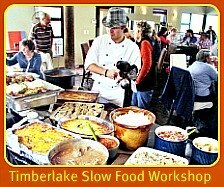 Once again our thanks to Blackwater River Lodge for providing the beautiful venue for our Flavours of France Slow Food Workshop. 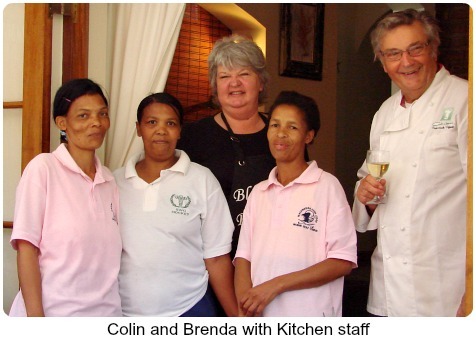 Our thanks to Brenda for hosting us and her staff for the work entailed in looking after us. 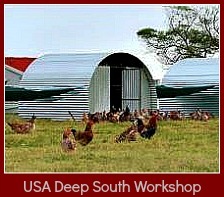 For many people it was the first time they had been there and venue made a favourable impression. 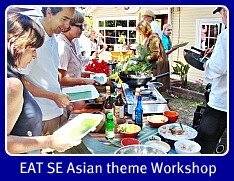 Thanks to our wicked international celebrity chef, Colin Capon who's quick wit enlivens the workshop with fun and laughter whilst delivering each themed dish with aplomb. 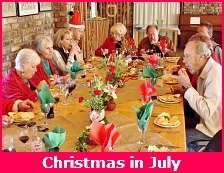 Thanks to Peter Vadas of popular Pembreys who lent a hand in the kitchen and our speakers, Gerhard and Vinessa for also contributing products to our two raffles. Thanks to Colin who also donated a bottle of wine to the raffle. Thanks to Tori who cheerfully and faithfully handles the registrations every month and to all who came and shared the Flavours of France day, making it what it was. N.B. 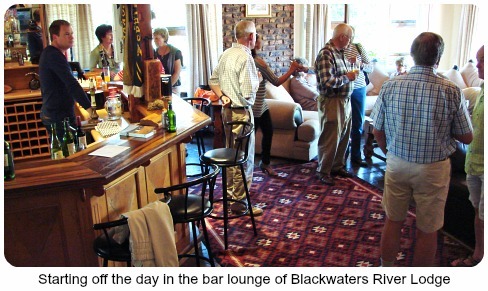 Blackwaters River Lodge was sold and has been upgraded by the new owners since our Slow Food Workshop there. The link at the bottom of the page takes you to the new website. It is a stunning place to stay. 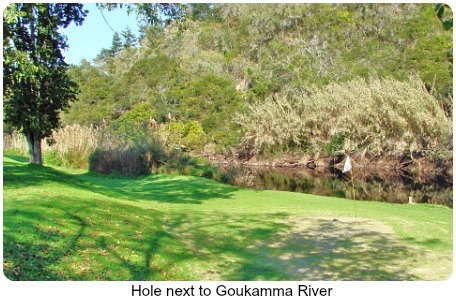 Blackwaters River Lodge is a magical hidden treasure, tucked away in a beautiful valley on the banks of the Goukamma River. 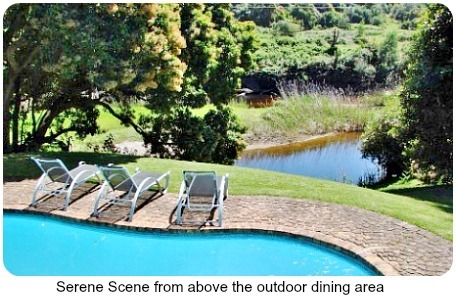 It is a 3 star guesthouse with 17 beautifully decorated luxury rooms, all with a touch of nature. 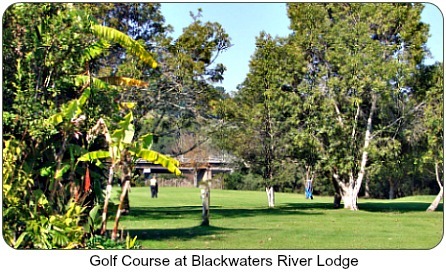 Surrounded by gardens and indigenous forest the Lodge offers peace, quiet and relaxation. 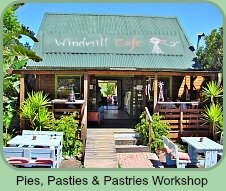 It is conveniently situated in the heart of the Garden Route just off the N2 opposite the Buffalo Bay turnoff. 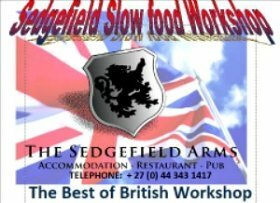 DISCOVER MORE ABOUT SEDGEFIELD'S SLOW FOOD WORKSHOPS BY CLICKING ON THE PICTURE TOPICS BELOW.